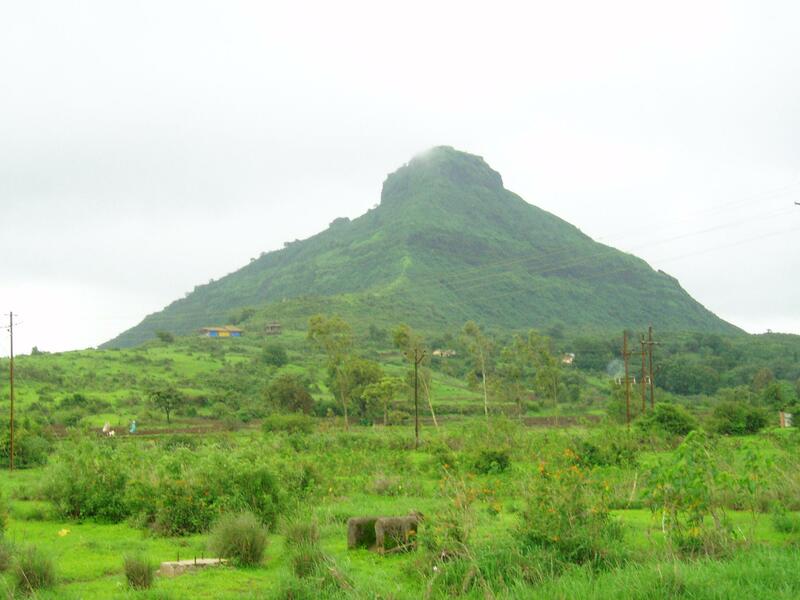 How to Reach: Tikona meaning triangle is situated in the Maval region of Lonvala. The base village is Tikona Peth. To arrive here one needs to take the diversion going to the Pawna Dam at Kamshet on the old Mumbai Pune highway. One comes across Kale colony is popular landmark on the way. On reaching the base village, keep walking keeping the fort on your right. The path tends to circle around the fort until you reach gorge between two hills. Just take the slope up on the right until to reach a small temple on the left. A gradual slope starts opposite the temple. The climb is straight and not tiring until the final steps. One spots a cave on the left while going up. The final steps which enter the fort are very steep to climb. One should be very careful especially during the monsoon. The whole fort can be seen in 45 minutes. There is a Mahadev temple at the top. There is a flag post on the back side from where one gets a breathtaking view of the Tung, Lohagad, Viaspur forts and the magnificent Pawna dam. Carry 2 litres per person from the Kale Colony. For shelter and rest the cave and the temple can accommodate around 10-12 persons. Visibility is very poor during monsoon. One can take an excursion to Pawna dam / Bedse caves on the way back. The best time of the year to visit this place is anytime besides summer. Duration: Around 1 hours from Tikona Peth village. Availability of food / water : The water available from the cistern may not be suitable for drinking. Carry water from Kale colony. Essentials : Carry water and food besides the regular trekking gear. Need footwear with good grips in case of trekking in during monsoon.